those who refused vaccination were then visited by the Medical Officer of Health, who “by persuasion, or pointing out the penalties of the law” induced the refuseniks to agree. After a little number-crunching, Dr Puckle concludes that the death rate from smallpox “would have been about 50% greater, if the same rate had prevailed in Lambeth as in the rest of the Metropolis”. This and other outbreaks made clear that the capital’s infrastructure could not cope. From 1867, the Metropolitan Asylums Board (MAB) started planning state services for the insane, and for those with fever or smallpox, across London as a whole. Stockwell, in Lambeth, housed one of the first of MAB’s smallpox hospitals. The Stockwell Smallpox and Fever Hospitals (later called the South-Western District Hospitals), was one of three pairs of smallpox and fever hospitals, carefully spaced to serve London, planned by the MAB. In 1870, another severe outbreak led to facilities overflowing once more: in February 1871, the still incomplete hospitals in Stockwell and Homerton were pressed into service and hospital beds were freed up by borrowing hospital ship the Dreadnought, moored near Greenwich, for convalescents. By the end of the decade, the MAB had established five paired hospitals in London although, perhaps not surprisingly, they faced considerable local opposition and logistical challenges. By the early 1880s, legal action had prevented the Hampstead hospital from taking smallpox cases and the Fulham hospital could only take local people. The vocal concerns of the neighbours of smallpox hospitals about transmission forced the authorities to act in 1881. Investigations by Dr Power, a medical inspector for the relevant Local Government Board into what appeared to be excess smallpox cases around the Fulham Hospital in west London, concluded that smallpox was transmitted through the air. Other professionals disagreed, but the reports and surrounding controversy all added to public concern and MAB decided to use hospital ships moored on the Thames: by 1885 almost all known cases were being moved to ships in the Thames estuary. 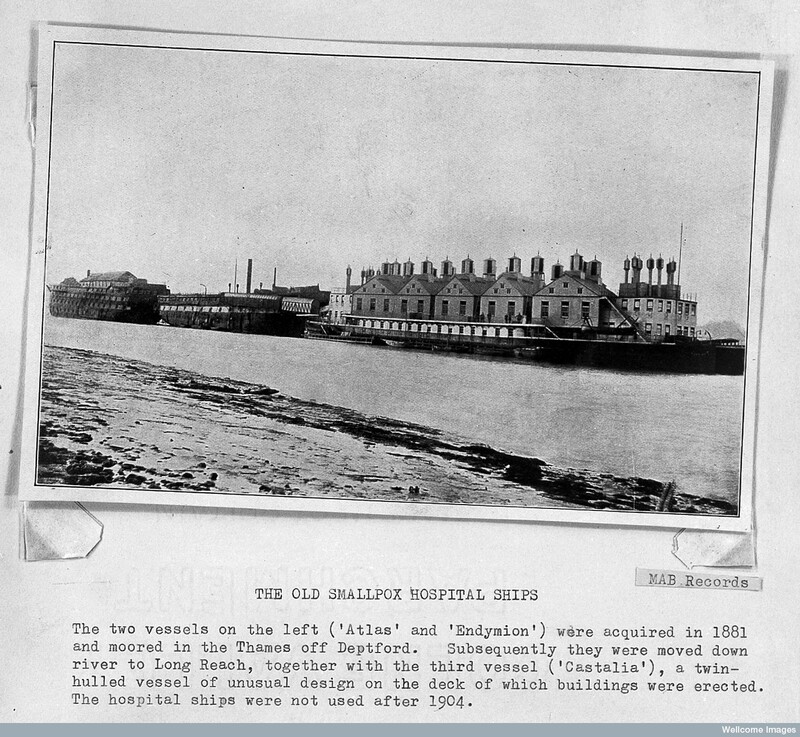 Smallpox hospital ships Atlas, Endymion and Castalia, at Long Reach. Wellcome Library, London, licensed under the Creative Commons Attribution only licence CC BY 2.0. In July 1881, during another epidemic, MAB acquired two hospital ships, the Atlas and the Endymion, and brought them to Greenwich. Over the following year or so, the battleship Atlas took on board 979 patients, of whom 120 died (Endymion was used for stores and administration) but these hospitals again failed to endear themselves to their neighbours. After the epidemic was over in 1882, the ships were moved downriver to the more deserted area of Long Reach, where they were joined, incongruously, by the Castalia, a paddle steamer replete with ward block buildings on deck. There they remained until 1902: they must have been quite a sight. The cost in a pecuniary sense has been great; but it is nothing as compared to the cost of human life……I know of no Disease that can be made so preventible as this— by the persistent compulsory vaccination, and re-vaccination, after the age of puberty of all classes of the community: it was to the neglect of this sanitary measure that we may attribute the sad sacrifice we have had of both life and money. He urges revaccination, pointing to a startling statistic from the Metropolitan Asylum District (over which MAB reigned): of the more than 14,800 smallpox cases admitted into the hospitals, there were only four well-authenticated cases in people who had been revaccinated properly – and these were mild ones. Smallpox vaccination was controversial, making isolation of people with the disease even more important. Baxby D. The end of smallpox. History Today 1999; 49(3). Dartford Hospital Histories, entry on Hospital ships. London’s Pulse: Medical Officer of Health reports 1848-1972, reports for Lambeth 1863 and 1871 and St Martin-in-the-Fields 1881. Mortimer PP. Ridding London of smallpox: the aerial transmission debate and the evolution of a precautionary approach. Epidemiol Infect 2008; 136(10): 1297–1305. The National Archives, entry on Metropolitan Asylums Board. National Health Service History, Rivett GC, entry on Smallpox and fever hospitals. PortCities, entry on Containing smallpox in Victorian London.